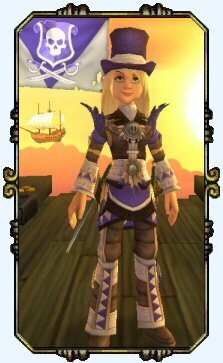 Scarlet is my second character in the public edition of Pirate101. She’s a magikal combination of the best parts of my witchy beta pirates. There were 3 in total to experiment with and choose from. Being a spiritual teacher and minister of my faith in real life, there was no question that at least one of my Pirates would be a “Witchdoctor” of Hoodoo. And here she is, born October 8th, 2012 near 10:30am eastern. 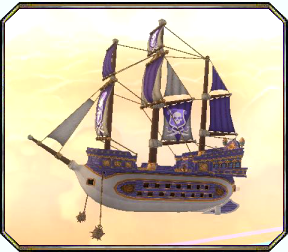 The first day Pirate101 went live with their full edition for the Head Start Week. As with Victoria Bristol, the predecessors of Scarlet will be missed. But this one holds the best parts of all of them and at least this one is safe from beta upgrades and resets. 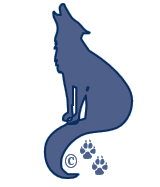 Scarlet’s parents are said to have been lost in an attack on their ship by the Armada somewhere in the Mooshu Skyways. The dastardly swines! She was rescued by chance as a ship from the Skull Island Skyways sailed through the area a few days later. 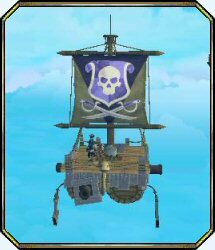 Taken back to the Skull Island Skyway, young Scarlet was raised on the isle of Skull Island by a wise old pirate witch. It was a great place to grow up if you’re looking for a sly and sneaky witch. 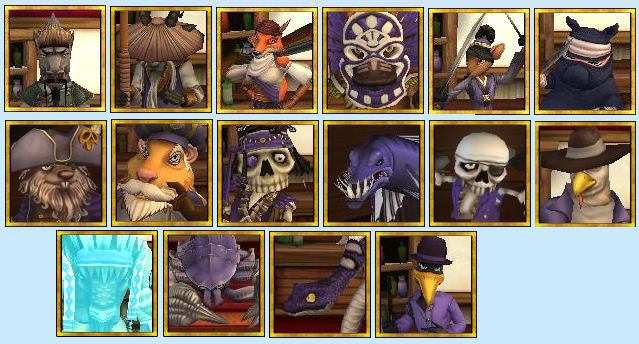 Temujin, a pirate from Mooshu who pulled young Scarlet from the floating debris, has been her friend and protector since she was young. At first his protection was a return favor to the Old Witch who had taken her in. But with his debt paid, Temujin had grown fond of Scarlet and found reasons to stay in town and help the Old Witch, so he could really watch out for the young girl he had grown so fond of. He stays by her side, even today. 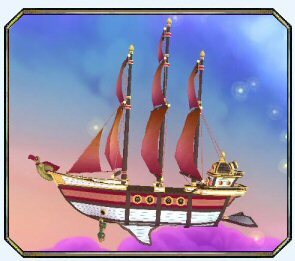 Her ship colors are: Purple and White to honor the magik of the Old Witch who raised her. 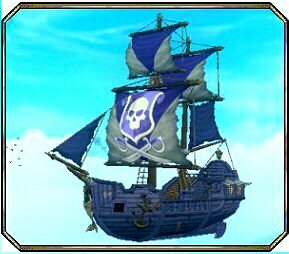 Her flag is an eerie jolly roger fit for a witch, a lady captain and her pirate ship! She really likes the goblet look of the shield sitting upon a stem of crossed swords. As if the jolly roger is working its magik to create a potion for her next victim. A sleeping aid perhaps? A love potion maybe? Or a fiendish brew that can melt the iron lock of a grand chest revealing it’s treasure inside. Who knows what lies within the brewing cabinet of a pirate witch. We’ll never tell! Har har! Scarlet and Temujin left Scrimshaw in hopes of discovering what happened to her parents and where she originally came from. They were able to acquire an audience with Captain Avery who did indeed know of Scarlet, her parents and her sister, Victoria Hawkins! hey have managed to trade messages through their mutual friend the Frog Father, but they have not yet managed a meeting. Perhaps sometime soon they will arrive in the same place and share a pint of yum. 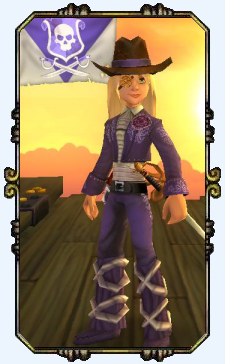 Scarlet is currently a level 31 Witchdoctor and Pirate Captain. 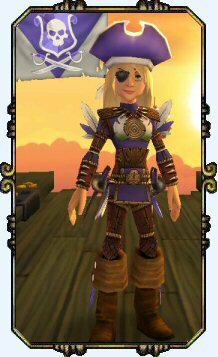 She is currently Pirating in Port Regal with her first mate, Temujin. Keep up to date with her adventures through the Captian’s Log. And more, frankly it’s hard to keep up with them all! Large Parrot – She affectionately named Big Jack. A reward from her early travels in the Beta Spiral. She has two homes. One for business and one for escape and relaxation. Pirate quarters on Skull Island are always used when she comes to town on business. Volcano Island estate to get away from the hustle and bustle of pirating around the skies.